Boy and Girl Under Umbrella 40" High Indoor/Outdoor Fountain | Fountain City Art Ctr. 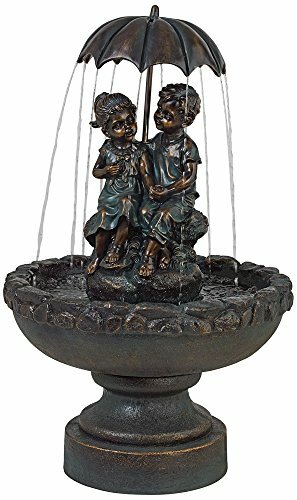 Add a sense of playfulness to your garden or patio area with this whimsical fountain featuring a boy and girl holding an umbrella. Water trickles down from the umbrella as the children seek refuge from the rain in a storm. The fountain is finished in green, copper and bronze tones and includes six feet of cord and a submersible pump. - 40" high x 23 1/2" wide and deep. Round base at very bottom is 13 3/4" wide. Weighs 40 lbs. - Boy and girl holding an umbrella fountain. A John Timberland fountain design. - Copper-green bronze finish. Cast resin construction. - For indoor or outdoor use. - Includes pump for easy set-up. Plug-in fountain with a 6-foot long cord. 40" high x 23 1/2" wide and deep. Round base at very bottom is 13 3/4" wide. Weighs 40 lbs. Boy and girl holding an umbrella fountain. A John Timberland fountain design. Copper-green bronze finish. Cast resin construction. Includes pump for easy set-up. Plug-in fountain with a 6-foot long cord.